The very root of what makes a home green is how effectively it responds to its surrounding environment. You could say that this has defined the primary material pursuit of mankind for all time – building better shelters to keep us warmer, cooler, and drier. Many of the native building techniques employed centuries ago are still reliable in similar climates today, and used as optimal models for environmentally conscious architects. That said, since global acceptance of the air conditioner in the 1950s, the benefits of responding to a unique climate have been left by the roadside. Illustration of passive solar heating and cooling, via Wikimedia commons. The USGBC’s residential program doesn’t establish requirements for site orientation because every homeowner has a unique building and site, however, the relationship of your home to the sun and wind is paramount in maximizing thermal efficiency. 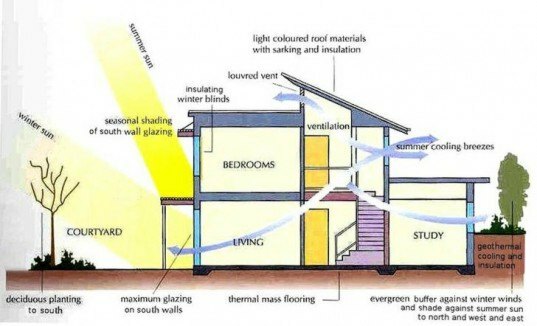 Situating your home (as well as your rooms, doors, and windows) in a way that makes maximum use of sun paths and wind patterns is called “passive design”, because it allows your house to function without active mechanical heating and cooling. Passive Design is the best and most-obvious way to start a green building, because it improves ventilation, it’s more comfortable than living with constant heating and air-conditioning, it significantly reduces electricity bills, and it reduces greenhouse gas emissions from heating, cooling, mechanical ventilation and lighting. There are some basic rules you can abide by, such as capturing the breeze for cross ventilation in warmer climates, or deflecting the wind over and around your house in colder ones. The shade of trees not only makes the outdoors more livable for people, but it keeps the mass of your house from absorbing unwanted heat. No trees? Consider porches, pergolas, and deep overhangs. Although they won’t shield your roof from the sun, they will help cool walls and create a cooler microclimate around the home. If you’re in a colder climate, turn the broadest side of your home towards the sun. In a warmer climate, turn the broadest face away; this principle also applies to windows and any other openings that let in light and heat. Aside from taxes and legal documents, there are few subjects that might cause your eyes to glaze over faster than insulation. It’s just the stuff that goes in the wall, right? Well, there’s a lot to be gained both in comfort and money by a little extra knowledge of the subject. Every material has a specific ability to resist heat traveling through it; this is its R-value. Higher value = better insulation. Insulation can range from plain fiberglass batts (R-2.2) to high-tech aerogel based products (R-50). For the residential market, however, there are essentially three forms of insulation: flexible sheets, rigid boards, and spray or blow-in products. 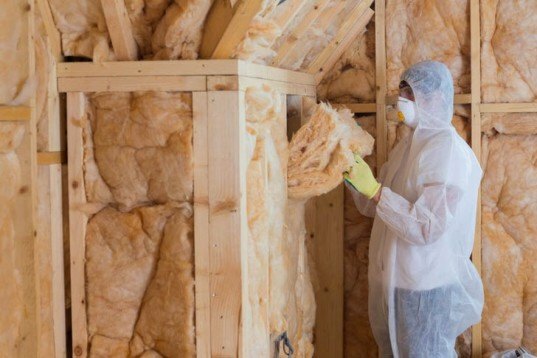 Rather than get too in-depth here, you can visit the DOE website for a better breakdown, or check back this week for a more complete discussion on the pros and cons of typical insulation and some of the more environmentally friendly alternatives. The ubiquitous building wrap, via Wikimedia Commons. Much like carrying water in a strainer, this can be a tricky problem. Half the challenge is in pinpointing just where and how your home is leaking precious climate controlled air. Suspect areas might be around light fixtures (especially recessed ones), electrical outlets, attic access openings, old wooden floors, cracks in walls, and most often through gaps around windows. With newer homes, an air/moisture barrier such as Tyvek is wrapped around the frame of the house before the exterior cladding goes up. In respect to air leakage, this helps tremendously, but the pros and cons of sealing off structures is a passionate debate within the architectural and building community (think mold, which is a whole other topic of discussion.) Should you desire, there are testing companies which can determine where you might have air leaks by performing a blower door test. Your windows can be engineered to block heat in the summer and cold in the winter. Windows let in not only visible light, but infrared and ultraviolet light as well. These forms of radiation hit interior objects and raise their ambient temperature – such as your napping cat, for example. Nowadays, most windows have a factory-applied coating, but you can also pick up IR and UV blocking tints at your local home improvement store. 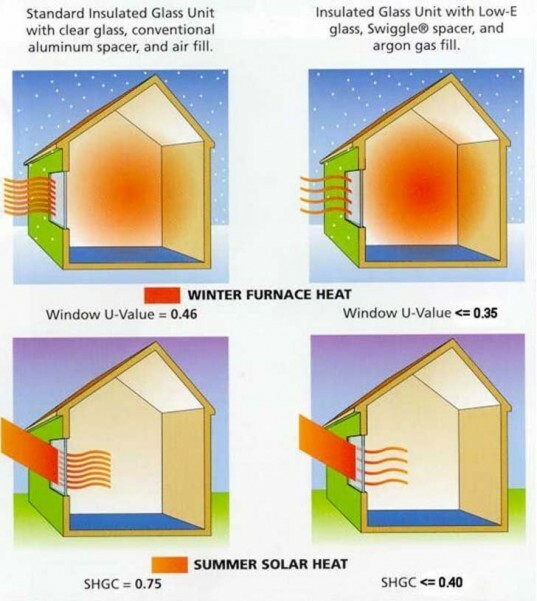 If you’re purchasing windows, be sure to take note of the U-value, which is a measure of how much heat makes it through an assembly (as opposed to an R-value, which is a measure of resistance.) The lower the U-value of your windows, the more insulation they provide. Due to U.S. energy codes, insulated glass is becoming more common in new construction and renovations (two panes of glass sandwich an airspace, which serves as an insulator). To improve upon this, commercial manufacturers often use a specially type of glass with a coating on the outside called “Low-e” (low-emissivity) glass, and then fill the gap between the double panes with argon gas, which thermally responds slower than air. This might sound a bit excessive to those of us living in warm climates, but it’s very common for new buildings in Germany and Scandinavia to have triple glazing to really help knock out the cold. So how do you improve your old fashioned single pane windows? Re-caulk them. Replace the weather stripping. Repaint them, filling in any gaps between the glass and the frame. And if that doesn’t help, try storm windows. When placed directly outside an existing window, these lightweight plexiglass assemblies essentially create another barrier between your conditioned air and the outside. They’re generally not very beautiful, but they succeed at creating an insulating air pocket. Condensation is a good indicator of poorly insulated windows. Photo via Wikimedia Commons. If you live in a perfect climate and your house was built to utilize passive solar design elements, you might not need air conditioning or heating. Unfortunately, most of us are not so lucky. We live in houses and apartment buildings that can’t be shifted around on site or significantly renovated. With that in mind, the most obvious place to look for improving your home’s energy efficiency is the mechanical systems that provide heating and cooling. First, run out and buy yourself some duct tape (it’s really wonderful stuff) and check to make sure all your ducts are tightly sealed to the grilles and air handler. Try to seal off all potential leaks – putting more of the air you’re paying for into the space that you occupy. The next step comes with a hefty price tag: If you’re in the market for a new central air system, be sure that it has a Seasonal Energy Efficiency Rating (SEER) of 13 or greater. As of 2006, it is illegal to buy anything less efficient anyway. If your twenty-year old system is running at 9 SEER and you upgrade to 13 SEER, you’ll save 30% annually. The greater the SEER, the greater the savings – but you will pay a premium upfront. If you live in a relatively cool location, weigh the cost of a higher SEER rating against the price. You may not get your money back over the lifespan of the unit, but you’ll have that warm fuzzy feeling that you’re doing something a little better for the environment. Most importantly, make sure it all works together! Great insulation with drafty windows gets you nowhere. You will defeat your high efficiency air conditioner if you also have large expanses of sun-collecting windows. To test the efficiency of these components, you can conduct a home energy audit to find problem areas. Or for an easier approach, invest a little research into the EPA’s Energy Star project. This not only encompasses the super-efficient appliances that you’ve seen for sale at Sears, but extends to nationwide building partners that abide by a strict set of guidelines to build high performance, energy efficient homes. And the EPA is always the first place to go for tips on energy efficiency. And of course, keep an eye out for our next installment, where we will have more tips for greening your home! Yes yes leave the duct tape out of the mix, terrible way to seal ductwork! And on the vapor vs. debate; One of the problems in the building industry is that we have a spreading "cult-like" mentality that worships at the "church of polyethylene". This cult views the answer to all moisture problems as the installation of a polyethylene vapor barrier condom on the inside of buildings. This cult is responsible for many more building failures than building successes. It's time that the cult to go away! As to Dan's comment, really? 3 to 4 weeks using his air conditioner, why not fans and a lemonade? 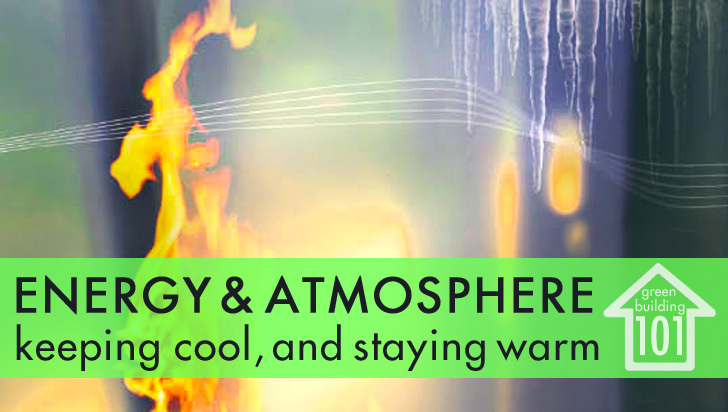 I know its stifling, but I have survived a week or two in Maine during high humidity without air conditioning and still here to blog about it...that may be the problem, using the old and not the new, is it because of the payoff's? is using more and energy the answer, and using dirty coal as a source? Lets just build better, and not to "just code"! Can't wait to read more about this as I know our home could you use energy efficiency upgrades. This article is interesting, but I think that the passive solar heating diagram is for the southern hemisphere. Note that it says summer sun is Oct. to Feb. and that winter is from July to May. It also says to maximize glazing on the north side. For passive solar in the northern hemisphere you need to maximize glazing on the south side. Thanks for not suggesting replacement of single paned windows. I work in preservation and it is a constant challenge to educate people that even with windows, infiltration is still the major source of heat loss. One minor nit...it is not actually illegal to purchase air conditioners rated at less than 13 SEER. As of January 2006 manufacturers were required to make products that meet or exceed the 13 SEER requirement. Any product in the pipeline before then is perfectly acceptable to purchase. I know this because I own a heating and air conditinoing wholesaler. The sad fact of the matter is people in far north climates (such as myself in Wisconsin) got totally hosed by the legislation. 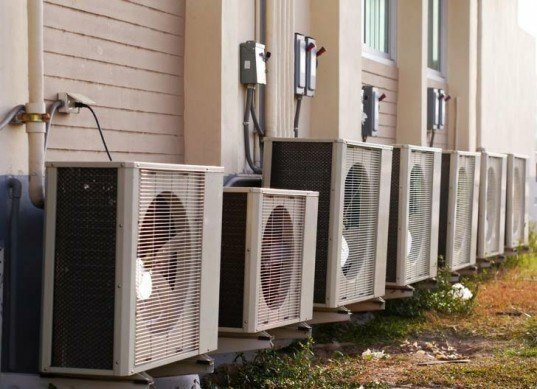 The difference in cost between the old units and the new ones takes DECADES to pay off in energy savings in the cooler climates. An upgrade from 9 to 13 SEER will save you energy costs, no doubt about that. It is the rate of payoff that is important. When you only use your air conditioning three or four weeks out of the year...well, you get the drift. Those in the southern climates certainly benefit, but not in the far northern portions of the US. Todd, great point about vapor, and the greater potential for moisture related issues (i.e., mold) in tighter homes. I think more in terms of isolation than insulation. You want to definitely create a supertight seal, so you can control flows... So, definitely, building science goes way beyond simply adding insulation. You might make note that your passive design illustration and text come from AUSTRALIA, so that the angles and dates quoted are effective only for those southern latitudes. Perhaps you could update with an available chart and illustration for the NORTHERN hemisphere, also? Great website. Nice to see good information. There are many new and improved materials. Sray on rigid foam is the best insulation and adds structural strength to your structure. Duck tape has a very short life. Foil back adhesive tape is the housing standard and last the life of your structure. Thank you for sharing ideas from other countries who have been fighting high energy prices much longer than the US. 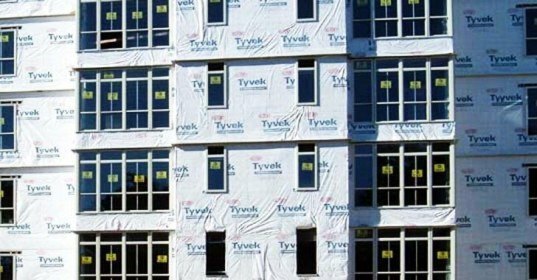 Does anyone have any good links about the "pro/con sealing off structures debate" mentioned in the Make Your Building Air Tight section of this article? I live in the gulf-coast area, and to build a house that captures crosswinds seems slightly dangerous when hurricanes are commonplace. Thanks for doing this series. Informative stuff!